Mahammad Ghavi-Helm was born in 1951 in Tehran, where he trained at the Superior Conservatory of Music. He then continued his studies in France under Sylvio Gualda. In addition to his activities as a solo performer he holds seminars on the art of improvisation in Iranian percussion and he teaches western percussion at the Conservatories of Palaiseau (near Paris) and Bourges. 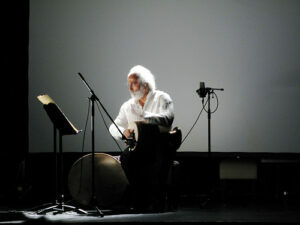 Ghavi-Helm has played with many of the foremost master musicians of Iran. 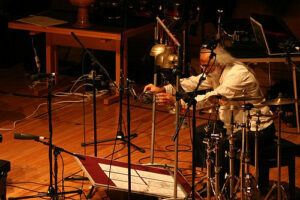 He has performed and made recordings all over Europe, Asia and America. Mahammad Ghavi-Helm’s encounter with Edison Studio led to a show in which East and West blend, with a music that includes and cuts across Iranian traditional music, new technology and contemporary music. There are four pieces in the program. In “Bi Ma” (Devoid of Self) by Alessandro Cipriani a man is surrounded by the metallic clinking and jingling of cymbals and bells. He plays them without looking at them, and he seems to become completely filled with sound. In “Alba” (Sunrise) by Mauro Cardi a circular motion pervades the score, with inner journeys in search of oneself. “Altri Passaggi” (Other Passages) by Fabio Ciardi represents an initiation of the listener into the mystery of the drum, as a bridge between heaven and earth, the mother of all things. “De Zarb à Daf” by Luigi Ceccarelli is a tribute to this master from Tehran, an innovator of Zarb playing technique, and this piece is also a virtual bridge between the ancient traditional manual technique and new digital technology.